Image: Architecture students watch artists while exploring Launceston city to help inform their designs for an effective performance structure. 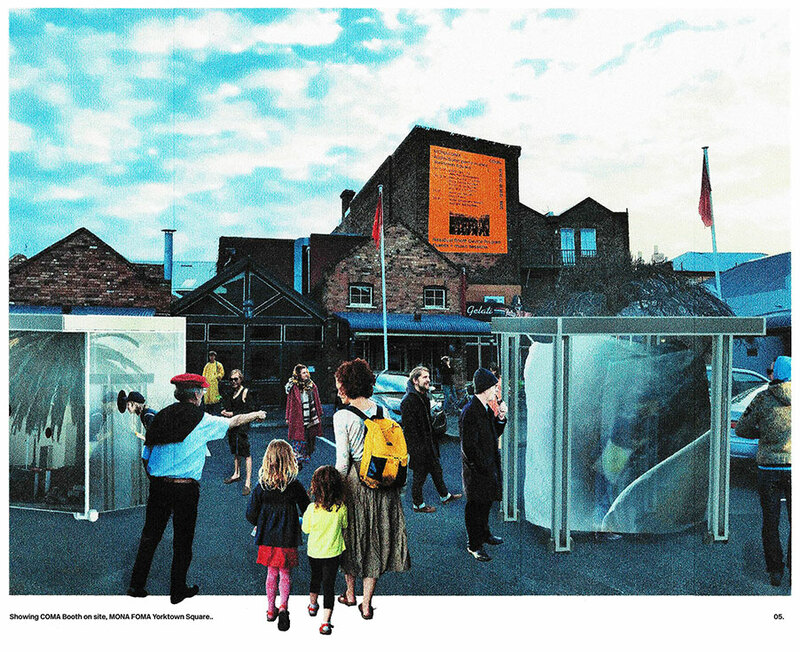 This year the infamous MONA FOMA (The Museum of Old and New Art, Festival of Music and Art) relocates from its decade long base of Hobart, to the northern riverside city of Launceston. With a new city and site locations, the festival organisers had a number of challenges to consider. Enter second year architecture students from Monash University and the University of Tasmania, who teamed up to tackle the architectural, sound and atmospheric challenges in a design studio project they titled ‘MONA COMA’ (City of Music and Art), a play on current title FOMA ‘Festival of Music and Art’. Alex Brown, Senior Lecturer Architecture, Monash University said that after the initial class time the students were eager to get on-site and ‘sound out’ spaces within Launceston to explore how they could design a series of festival-based structures that are easily moveable for events, scenarios or performances. “While exploring the various locations within the city the students took into consideration the many acoustic needs of the performers, the audience and event organisers. Brown said. “The organisers were keen to have a structure that could be used by the festival and the city all year-round”. While in Launceston the students from the two universities participated in intensive workshops and site investigations with key stakeholders from MONA FOMA. They also gained direct insights from some of the festival artists including Yyan Ng, Karlin Love and Suzanne Turner and Emma Anglesey. “The workshops gave students direct access to key players including the MONA FOMA curators, producers, sound technologists and artists - that direct experience is invaluable”. “It allowed them to gain essential experience working in multi-disciplinary teams, which reflects how architects work with various stakeholders in commercial practice. “Brown said. Brian Ritchie Curator at MONA FOMA and bass guitarist for alternative rock band Violent Femmes said he was keen to work with the universities to help solve questions they had around spatial issues and how performance could work in the new locations. “We wanted to work with the architecture schools to generate ideas, to create some sort of infrastructure that could be debuted at the festival but continued to be used throughout the year”. The students presented their ideas of a ‘Booth’ where performance and recording could occur in public spaces. Dr Toby Gifford, Sound Recordist and Research Fellow, SensiLab Monash University said that “what the students presented was a deconstructed and unexpected concept”. 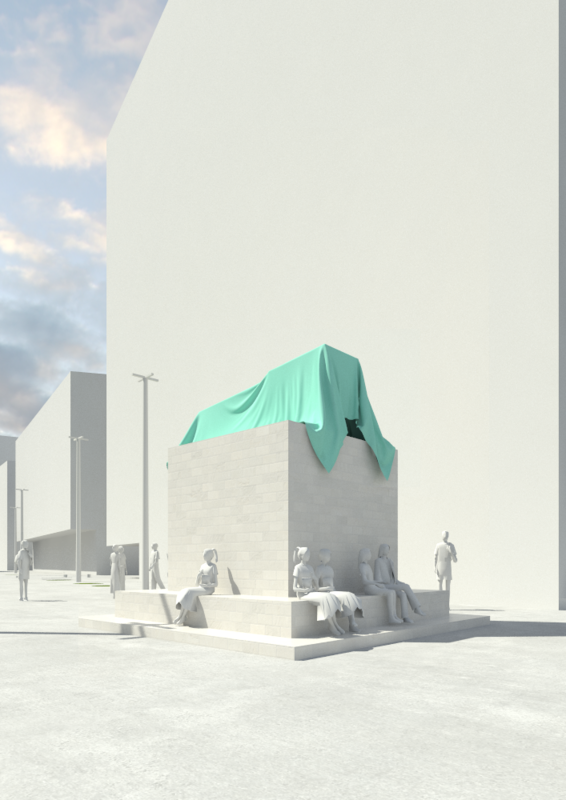 Image: Bachelor of Architectural design student Tom Jordan's concept shows a booth design in Yorktown Square. Tom Jordan, second year architecture student at Monash said the experience was highly immersive and provided great practical insights into the industry. “It made me see and think about architecture in a different way. From how we use space and how we think about sound when forming our designs. This information adds news layers to our work, it informs and shapes the buildings we are creating.” Jordan said. Alex Brown said that one of the key outcomes from the MONA FOMA studio was it introduced students to alternative modes of architectural production by asking them to think about how sound is used and incorporated in design and provided students with the opportunity to make beneficial connections. “Monash aims to produce architects who can look beyond the often primarily visual considerations of the early design process, to think more creatively and conceptually about sound and multi-sensory conditions” said Brown. 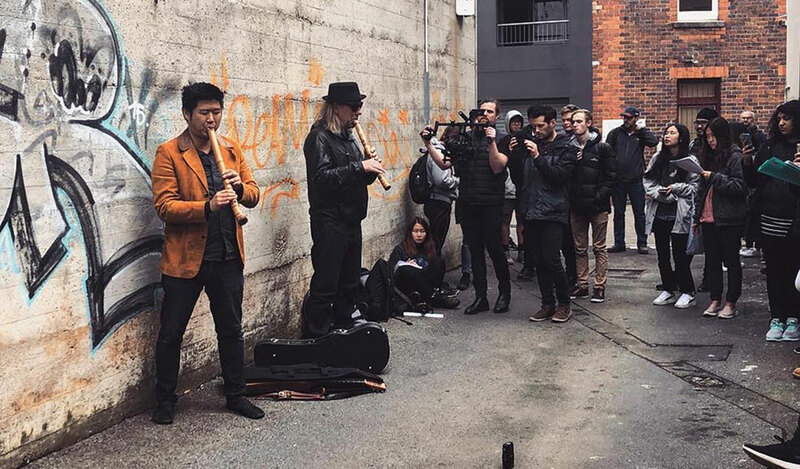 The University of Tasmania and Monash architecture design studio collaboration helped to inform some of the design thinking for the first SOMA (Sound or Music Architecture) structure which was part of the 2019 festival in January. MONA COMA was a second-year architectural travelling studio led by Alex Brown, Senior Lecturer, Architecture, Monash University in collaboration with Dr Andrew Steen and the School of Architecture University of Tasmania. Video: Produced by the University of Tasmania the video highlights the collaborative MONA COMA project with Monash Architecture students. Monash University Architecture develops graduates with a vision to design progressive architecture that responds to the dynamic needs of society and speculates about the future of our built environment.